Written by PJ Lobster House on January 31, 2019 . Posted in Blog, Holidays. Make this Valentine’s Day special. Bring your catch to PJ Lobster House! Seafood is delicious and romantic, and PJ Lobster House has an incredible selectionof menu items sure to please you and your date. For the starter, consider sharing some oysters, calamari, shrimp, mussels, or scallops. If you don’t want to start your meal off with seafood, PJ Lobster House also serves mozzarella triangles, spinach and artichoke dip, and boneless wings. At PJ Lobster House, we serve several different salads that are refreshing and tasty. Order our Mediterranean Salad with romaine hearts topped with feta cheese, stuffed queen olives, tomatoes, cucumbers, red onions, and a homemade feta cheese vinaigrette dressing. Another choice is the fish salad, made with bay scallops, mahi-mahi, salmon, or tuna, as well as classic garden ingredients. We also have a classic caesar salad, a crab cake salad, and house salad. The Lobster Lovers menu at PJ Lobster House is a perfect menu to order a Valentine’s Day dinner from. Gourmet and delicious, you and your date can enjoy the traditional lobster dinner served with a house garden salad and two side dishes. You can also order the twin lobster tails, served with a house garden salad and two side dishes, or the Lobster Fra Diavolo, which includes 1 1/4 pound lobster, sauteed with shrimp, mussels, scallops, and clams in a spicy marinara sauce served over pasta alongside a house garden salad. If you’re a fan of surf and turf, try our PJLH NY Shell Steak or the char-grilled sirloin steak. The first option features a 12 oz. USDA Choice shell steak that is seasoned and grilled to your liking and served with two sides. If you pick the char-grilled sirloin, you’ll receive an 8 oz. USDA Choice sirloin steak that is also seasoned and grilled to your liking and served with two sides. 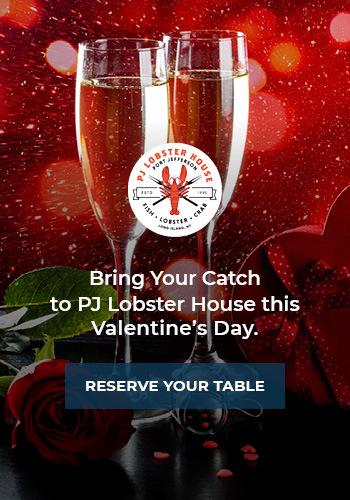 To make your Valentine’s Day reservation at PJ Lobster House, call 631-473-1143 today!